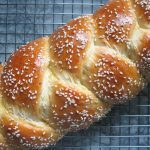 Directly from Deanna, this is probably the girls’ most favorite bread (remember I said bread…Potato Buns still win in every other category). There are several variations out there, as well as several types of ‘cracked wheat’ (I used Clic dark bulgor wheat #2) – allrecipes.com uses all honey (and milk and butter), King Arthur Flour recommends adding sunflower seeds (they also have a very interesting version using almond paste), and Crosby’s Molasses’ recipe substitutes wheat bran for the usual whole wheat flour – my aim is to try all of these eventually! Ma decided ages ago to omit the honey and just use straight molasses, below is the halved version of the recipe she gave me – it makes 2 regular-sized loaves (8×4 OR 9×5) or 4 small ones (5.75×3) – enjoy! In a small bowl, combine these 3 ingredients…take your time, you want the yeast to dissolve and it will be paste-like. In the bowl of your electric mixer with the paddle attachment, add the water, molasses, salt, cracked wheat, whole wheat flour, 2 cups flour, oil and the yeast mixture. Mix on low spread until combined and then increase the speed and beat for about 2 minutes – the batter will be quite elastic. Switch to the dough hook attachment, add in another cup of flour and knead until the dough comes together. I ended up adding another 1/2 cup of flour (for a total of 3 1/2 cups of regular flour), so you’ll need to add more, the trick is to have it be pliable but neither too sticky nor too stiff – I let the dough hook knead for about 5 minutes. Shape the dough into a ball, place it in a large greased bowl, cover it, and then leave it to rise for an hour or so (I used the proofing setting on my oven). After it’s risen, punch it down and then divide the dough into 4 equal parts (if making 4 small loaves), shape each portion into loaves (I definitely need some practice with this! ), place them into lightly oiled loaf pans, then cover them and allow them to rise again for about a half hour. When ready to bake, preheat the oven to 375 and bake the small loaves for 20 to 25 minutes (the large might be more like 40 minutes) until the tops sound hollow when tapped. 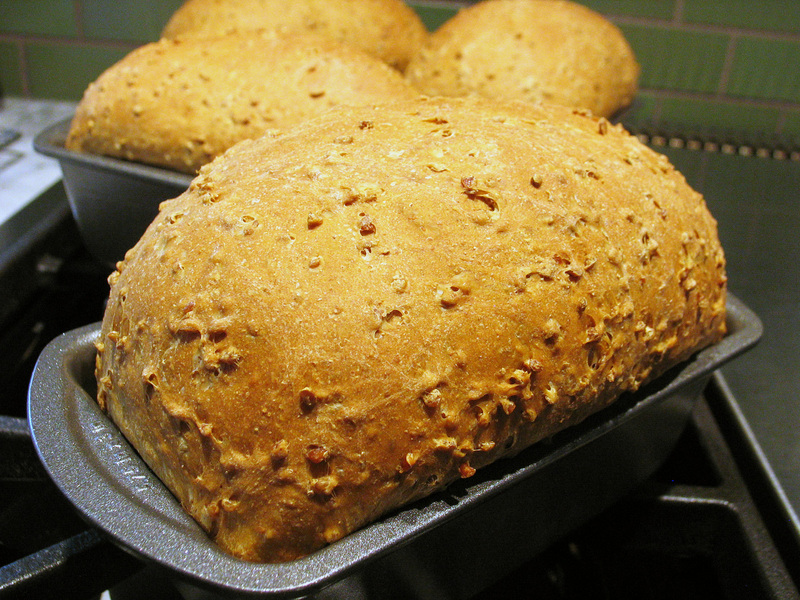 Allow the loaves to rest in their pans for a few minutes then turn them out onto a rack to cool completely. Wrap well and freeze for later – but definitely leave one out for an amazing after school snack!